: Board Collector: Aussie Bertlemann? In the 70's the arrangements that US and Hawaiian surfers and board makers had with Australian licensees, associates and surfboard making friends was loose to say the least. For example, I'm unclear of the relationship between the Western Australian Town and Country label and T&C Pearl City Hawaii, those Star Bolt boards look dodgy and I doubt the many professional and back yard board makers in the 70's who sprayed a Lightning Bolt on their boards ever sent a royalty cheque to Jack Shipley. Never the less there were many legitimate arrangements between traveling pros and Australian board builders. Its certainly been established that Gerry Lopez shaped a hand full of boards in between surf trips and comps at the Bennett factory in Brookvale. So I had no reason to think that Larry Bertlemann did not have a deal with Bob Cooper on the north coast to do an officially licensed version of his design, in fact there no reason to think that Larry himself didn't stop off and shape a hand full of boards for a little cash, food and lodgings. Upon getting hold of the board I couldn't find any LB markings on the deck. Looking closely I realized the olympic rings had a decidedly 'hand drawn' look to them. My final assumption is as follows. 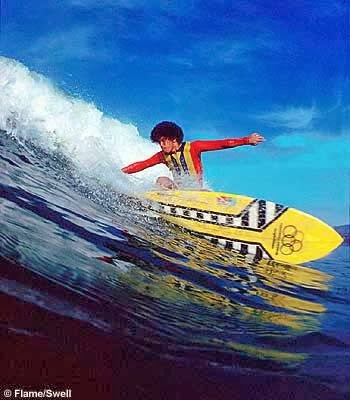 That a star struck kid in the late 70's, with a nice old Cooper single fin, in awe of Larry's amazing surfing, replicated his signature board graphics with some tissue paper and some pigment resin. Either way, from Larry's own hand or from the the hand of a dedicated young fan, a nice board to have and to hold.